Projecting a grim picture of the extent of criminalisation of politics, the Centre has informed the Supreme Court that 1,765 MPs and MLAs, or 36% of parliamentarians and state assembly members, are facing criminal trial in 3,045 cases. The total strength of lawmakers in Parliament and assemblies is 4,896. The government gathered details of cases against lawmakers for the first time to put them on fast-track hearing to conclude the trial within a year. In an affidavit filed in the Supreme court, the Centre has placed state-wise figure of cases pending against lawmakers which will be assigned to special courts to be set up to exclusively hear these cases on day to day basis. 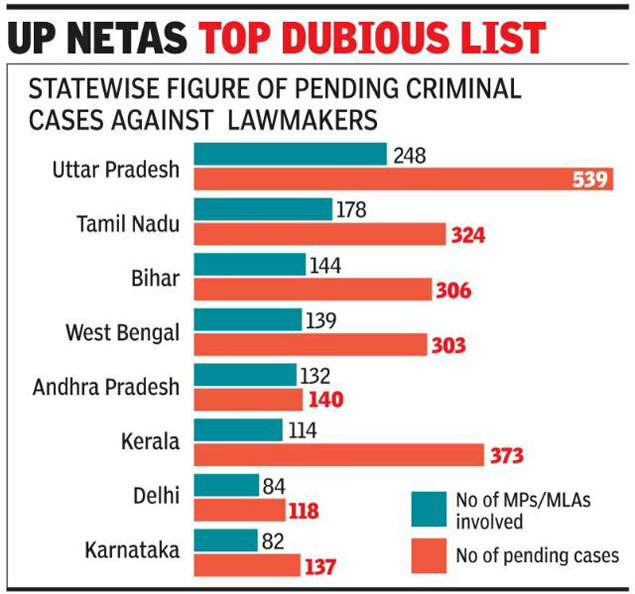 The highest number of cases against lawmakers is in Uttar Pradesh followed by Tamil Nadu, Bihar, West Bengal, Andhra Pradesh and Kerala. Case details against lawmakers from Maharashtra and Goa were not mentioned by the Centre as information had not come from the two state governments and the high court. As the number of cases against lawmakers was not available with Centre and the Election Commission, the apex court had granted the Centre two months time to compile the data so that a decision could be made on the number of special courts to be set up to hear such cases within a year, a timeframe fixed by the SC in 2014. The Supreme court had asked the Centre to constitute special courts to exclusively deal with cases against the lawmakers. On the basis of figures provided by NGO ‘Association for Democratic Reforms (ADR)’ which had alleged that 1,581 cases were pending against lawmakers after the 2014 elections, the Centre framed a scheme to set up 12 fast-track courts across the country to try such cases. But now, the Centre will need to double the number of special courts as the total cases stands at 3,045. The affidavit was filed in compliance with the SC’s order directing the Centre to collect data on pending cases against lawmakers after petitioner Ashwini Kumar Upadhyay has contended that the number of cases was more than 13,500. Two special courts are to be set up in Delhi to handle cases against 228 MPs and the other 10 courts are be set up in 10 states — Andhra Pradesh, Bihar, Karnataka, Kerala, Madhya Pradesh, Maharashtra, Tamil Nadu, Telangana, UP and West Bengal — where number of tainted MLAs are more than 65 each. The government had earlier told the court that the scheme was planned as a tentative measure and it would be modified to increase the number of courts after collecting information on all criminal cases pending against lawmakers. On compliance of the SC’s 2014 order for disposal of criminal cases against lawmakers within a year, the Centre said the timeframe was complied with only in 16% of 771 cases decided since then. It said 125 cases were decided within a year and 646 cases were disposed of after one year.